Born and raised in Indiana, Mr. Bawcum graduated from the Thomas Jefferson School of Law in San Diego, California in 2005. 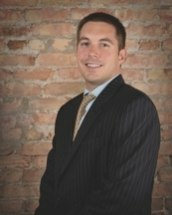 Before coming to SJTPM & A, Mr. Bawcum worked at a nationally recognized personal injury firm in the Chicagoland area where he assisted on high profile medical malpractice and catastrophic injury cases. Mr. Bawcum was then hired as an associate with SJTPM & A in 2006 and then named partner in January of 2013. Mr. Bawcum specializes and leads both the Firm’s personal injury and worker’s compensation practice and has produced millions of dollars in verdicts and settlements for his client, as represented below. Mr. Bawcum is a full service injury attorney, specializing in work related and major accidents, as well as catastrophic injury case.